In December 2008, two students of the de Kooning Academy Hogeschool Rotterdam launched a Firefox extension called Pirates of the Amazon that enabled users to download movies, games, TV shows, and MP3s free of charge by cross referencing Amazon’s product pages with torrent files from the Pirate Bay. If the content could be found on the Pirate Bay’s search index it showed up as a “Download 4 Free” link on the top of the Amazon product page. This linked directly to the hosted .torrent tracker file, suggesting the user to avoid purchasing it from Amazon in place of acquiring it illegally via BitTorrent. First major blog report was made by Torrentfreak, who noted that this was a really bad time for such an extension. “Piracy continues to be a huge problem for movies, music albums, and PC games. Amazon’s online MP3 store is one of the least expensive places to legally purchase DRM-free music, and this extension manages to make it that much simpler to pirate. It also coincides with a time of year when online retailers are getting an increase in traffic due to holiday sales”. The extension made the front page of Digg 2 days after it was launched (and reached more than 2500 diggs) causing a Streisand effect i.e. 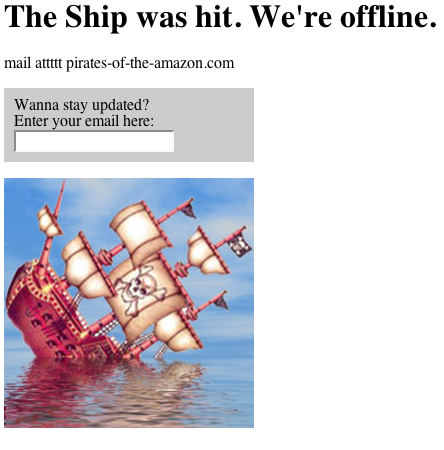 spread the news very quickly on the web and evenually forced the Pirates-of-Amazon.com site to be turned off. From that point onwards, the project was cited to Cnet, Wired Online, the WashingtonPost, NY times online and more than 1000 blog entries were made worldwide. Also, Joshua McKenty responded with a reverse add-on that inserted Amazon buy-tips on piratebay and mininova. On the 5th day, the course director sent out a call for support to nettime.org mailing list to gather statement about this initiative. He wanted to enlist support in the face of the conservative tone found on the digg and CNET threads. He stated that the take down request had not legal grounds since “the add-on itself did not download anything. It only provided a user interface link between the web sites Amazon.com and thepiratebay.org. Furthermore he asserted that the project was “not just as a funny artistic hack of Amazon.com and The Pirate Bay, but also as a critique of mainstream media consumer culture creating the great “content” overlap between the two sites. We clearly see this project as a practical media experiment and artistic design investigation into the status of media creation, distribution and consumption on the Internet”. Tobias C. van Veen, amongst others, responded by writing: By linking the BitTorrent search engine to Amazon in such a way to reveal the ‘links’ between paid and free content, a critical operation is opened between the two sites that, in its turn, opens a debate over the evolution of property in the 21st century. […] Thus we must ask what is achieved when such work is not only attacked by the corporate entity in this discussion, Amazon.com, but when the service provider is pressured to in turn subject pressure on the scholarly researchers to censure, remove and shut down the project. This is nothing less than the censorship of a critical scholarly text — a kind of book-burning of the 21C. And the discussion continued…by dword (735428) on Saturday December 06, 2008: Great, now /. is guilty of conspiracy to copyright infringement by offering a link to a web page offering a link to a .torrent file offering links to trackers offering addresses of people that offer to share an application that offers links to web pages offering links to torrents offering links to trackers offering addresses of people that offer to share copyrighted content with you. There, I said it! Amazon, the world’s largest online retailer based in Seattle, did not respond to repeated requests for comment during the busy holiday shopping season. The reason why I cited all the above documentation is twofold. First, I want to speculate on the initiative itself and second to comment on the online dialogue that the project provoked. In other words, my interest lies both in the actual event and the metadata. Through torrent search engines and online companies or services that offer directories to download stuff for free, internet users have adopted a peer-to-peer file sharing attitude that is ongoing and is growing in a fast rate. This peer-to-peer exchange escapes an overly controlling industry and exploits a new way to distribute content. No one is selling, however, it is against the property right of the creator that is, their copyright. The extension that the two students created gave to Amazon’s prospective buyers access to something that by law they shouldn’t have. It gave them access to download digital products for free. So, the question that comes into my mind is when comes the crucial point that piracy stops being useful and productive and merely steals? As Lawrence Lessig argues, technologies have always lead to new laws, but never before have the big cultural monopolists used the fear created by new technologies to shrink the public domain of ideas. What seems to be at stake in that case, is not merely the copyright rights of the creators but the right of internet users to freely access digital content. What also is indicative of such an approach is the fact that when some cases actually make it to court the illegal actions seem to point to the user of such free-downloading services and not the services themselves. As what is normally claimed is that a service or company that is enabling file sharing, functions as a kind of directory, providing links to other computers that are analogous to traditional Web search engines. And simply pointing to other places on the Net is protected by the First Amendment. Another issue that raised my curiosity is the online free software BT Guard. It is a bittorrent proxy that gives anonymous IP address and encrypts the downloads. “Not even the ISP will know what you are doing” it claims. Is that a solution? Is that software legal? Services get it away by blaming the users and users will try to hide behind anonymity? Will peer-to-peer exchange become a hide and seek game? Is it all about linking and browsing? How will the law confront with that and how will it punish actually harmful activities and not those that simply raise suspicion? How will the internet users be protected of not losing their right to access cultural goods? Is Creative Commons a possible and liable solution that could balance copyright and accessibility? In the web 2.0 era, peer-to-peer communication seems to entail a new online ethos that is open, community based, heterarchical and meritocratic. (Brunx A.) According to Brunx, the tools of communication are in the hands of a communication-savy public that have altered our dated concept of communication. It has changed to a liberating, spontaneous, interactive, co-authored network of limitless news and information venues. If that is the case, it makes sense that, what disturbed Florian Cramer the most, the course director of the project, was not Amazon’s threat of litigation but the negative discourse that immediately was spread online and actually condemned the Pirates of the Amazon project. And that leads me to my final question. Is our own responses to such events and our biases our own limits and barriers to a future free-culture? How savy is the public and how is the public opinion affected and formed online through the process of highlighted news? With the proliferation of aggregators, analytics, bookmarking and the notion of “the most popular” site, blog, tweet do we lose our autonomy to choose what is of our interest and how do the opinions of others affect and form our own? Does this immense structure constrain our linking and browsing tactics?